We all lead busy lives and waiting at a level crossing for a train to pass can be frustrating. But if you ignore level crossing warnings you are putting lives at risk – and not just your own. In 2014/15 nine adults and one child died on a level crossing, according to Network Rail data. Level crossing warnings are in place for a reason, so make sure you understand how to use a level crossing safely as a driver. 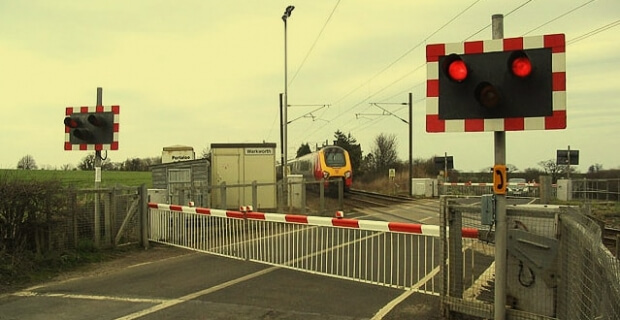 This year British Transport Police and Network Rail have been travelling across the country as part of Operation Look to warn people of the dangers of level crossing misuse. This is because although incidents are decreasing, there is still too much level crossing misuse in Britain. The graph above shows you how many incidents have occurred at level crossings since 2009. Network Rail, the company that manages Britain’s train lines, is working to eliminate the risk posed by the 6,300 level crossings on our rail network. They have been closing level crossings where possible, improving sighting at crossings and installing overlay barriers at open crossings, among other measures. Operation Look is a campaign by Network Rail and the British Transport Police (BTP) that aims to educate people about the risks of level crossing misuse. The operation has been backed by the AA and the RAC. According to an article on the BTP website, during a week of action in February 2015 officers manned a fleet of mobile safety vans at crossings across the country to closely monitor them. Darren Furness, head of level crossings for Network Rail said in the BTP news article: “Level crossings create a risk for people that we want to remove. Where possible we close them, and we have already closed more than 900 in the past five years. BTP Inspector Becky Warren told the Shropshire Star: “All too often people get into the habit of taking risks at crossings. Our message is simple – use crossings safely. When you’re about to drive across a level crossing you should be ready to stop behind the white line if the lights begin to flash and/or the barriers start to come down. Most road crossings have amber and red lights. If the amber light comes on while you’re crossing you must keep going. Never reverse onto or over a level crossing. You must stop your car behind the white line when you see the red light flashing. Once the train has passed, only cross once the barriers are fully raised and the lights have gone off, or when the operator permits you to do so. If the train passes and the red lights are still flashing, you must wait as another train is coming. Trains can come from either direction at any time, so never use previous experience or try to guess when the train is coming. Jumping the lights is just too risky. For more information on safely using a level crossing as a driver, check out this level crossings for drivers information from Network Rail.